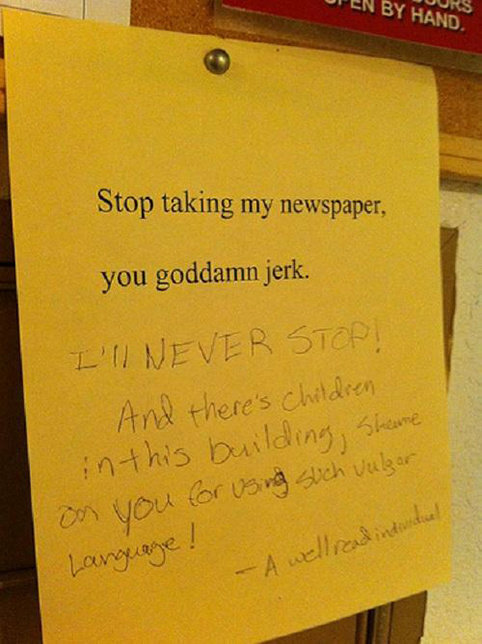 People tend to relax when they are angry by writing down a few things on paper. Maybe the receptor of the message made a mistake and didn't realize it or maybe it was conscious of the harm he or she was provoking. For that reason, the Internet is loaded with several notes that aren't heavy enough to qualify as threats but do leave a clear message. They are meant to change the attitude of their interlocutor by explaining with a little sarcasm the things they don't like. 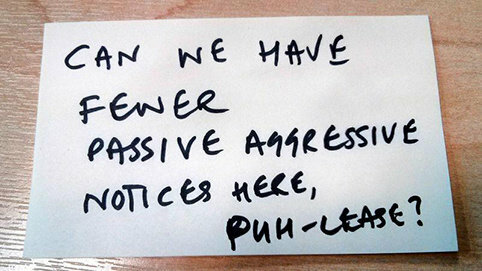 Thanks to the internet and the possibility of searching them, we could find the 50 hilarious passive-aggressive notes that we're sharing with you. 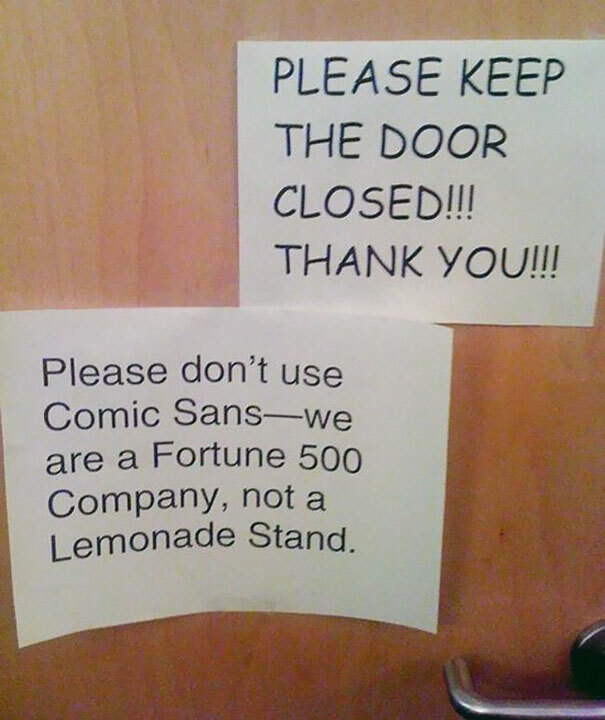 I'm not sure who was the creator of the Comic Sans font but Today is one of the most hated people in the world. It is the favorite font for the kids but it is totally useless for those who are trying to be serious. If both microwaves can't be used at the same time, why don't they gave away one to the employee that need it the most? This situation only tempts those who are really hungry and in a hurry. 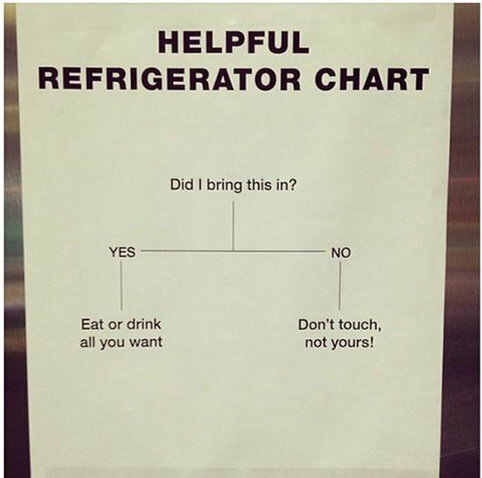 Milk demands people to be really caring about fridges and its contents. 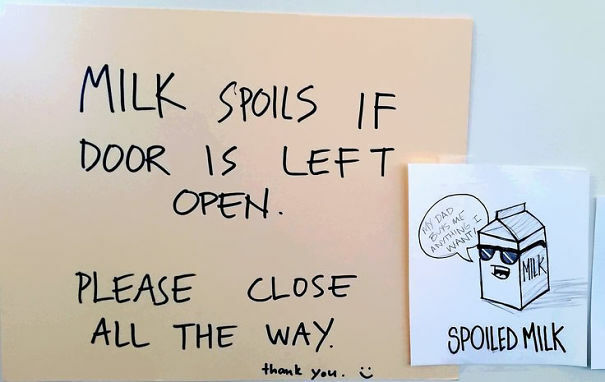 No one likes the smell of spoiled milk and I'm pretty sure no one laughed at this joke. I would call it chess! A pretty long message asking the receptor to quit its attitude and a three-word response that left anyone thinking about decisions in their lives. 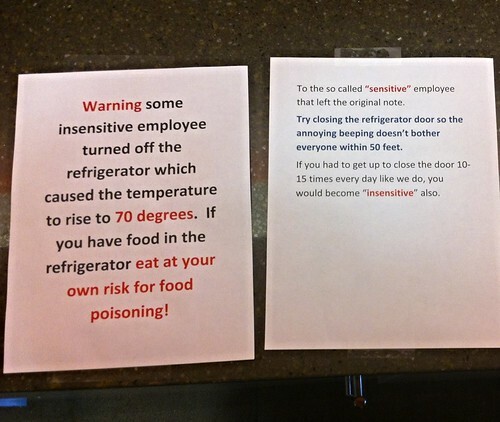 Someone hates being called insensitive and had the time to explain pretty clear the situation. 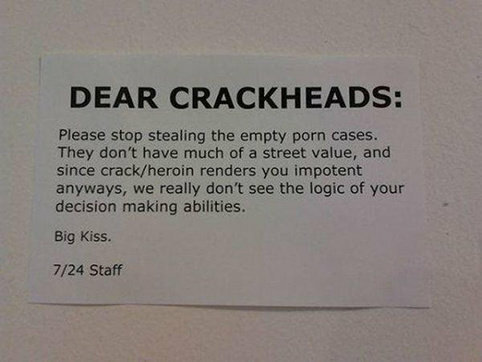 I think this isn't a note but a letter that you should send over the mail. 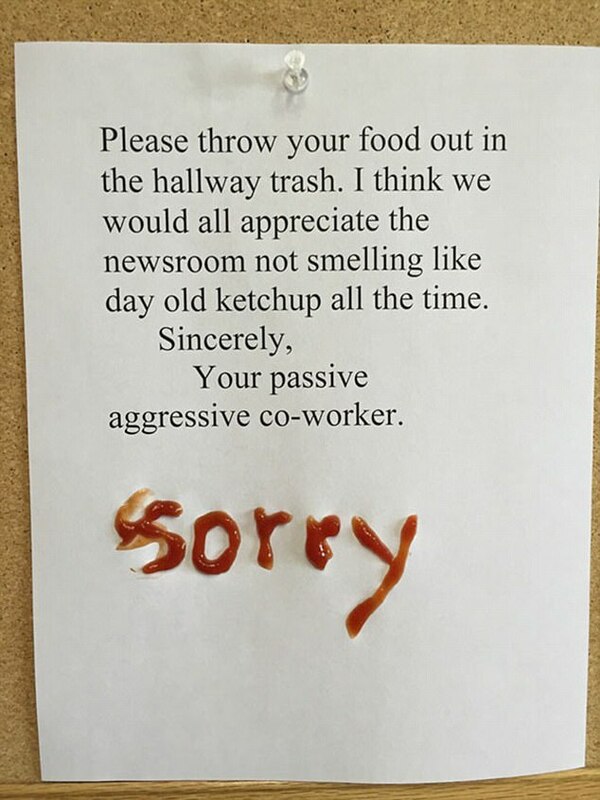 Someone had some extra ketchup and decided to share it with the other workers in the room. I'm pretty sure this wasn't the end of this disgusting beef and it would probably include more food. This would be a useful note for Ross to stop his boss from eating his sandwich. The message is clear and you can read it very fast. Don't touch what it isn't yours! I'm not sure if the number above is a 6 an 8 or a 0. 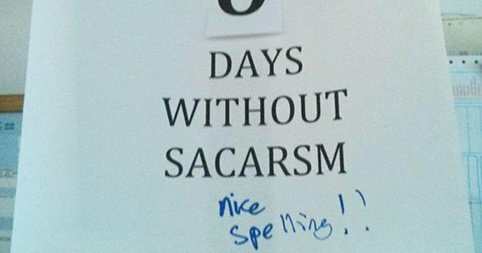 From now on it should be a 0, after the great act of sarcasm the one with the pen has done. 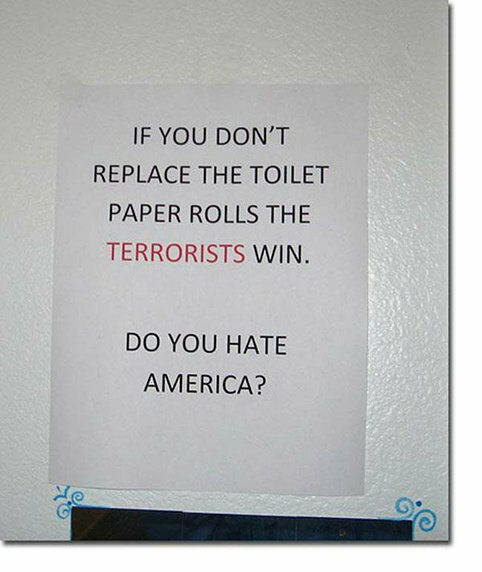 In order to get things done, the mind behind this note appeals to the patriotic sense of those who went to the bathroom. How hard is to replace the toilet paper? 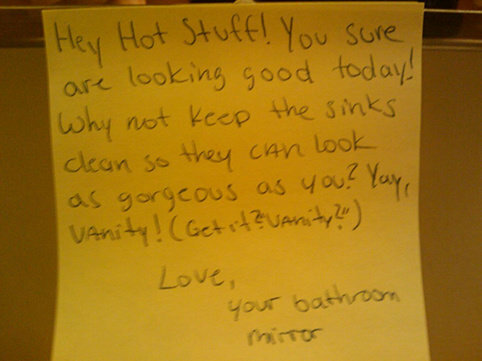 This note could be used pretty much with every roommate of yours. How disgusting and annoying is to do the dishes that someone else used and never cleaned? Do the dishes! This happens when you live in a pretty new building with thin walls. 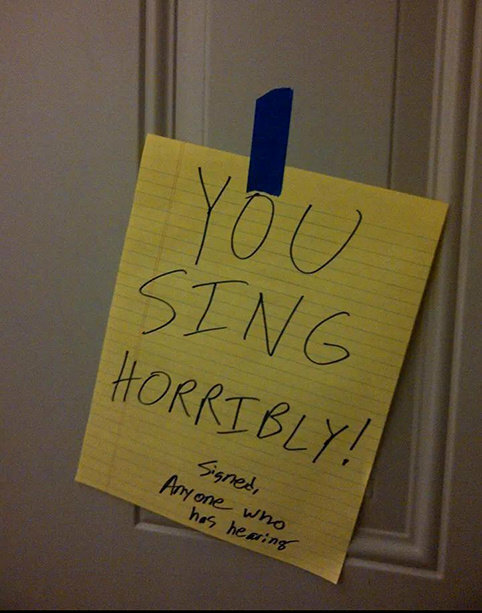 Pretty much everyone on the floor can hear how bad you can sing in the shower or while you're cooking. 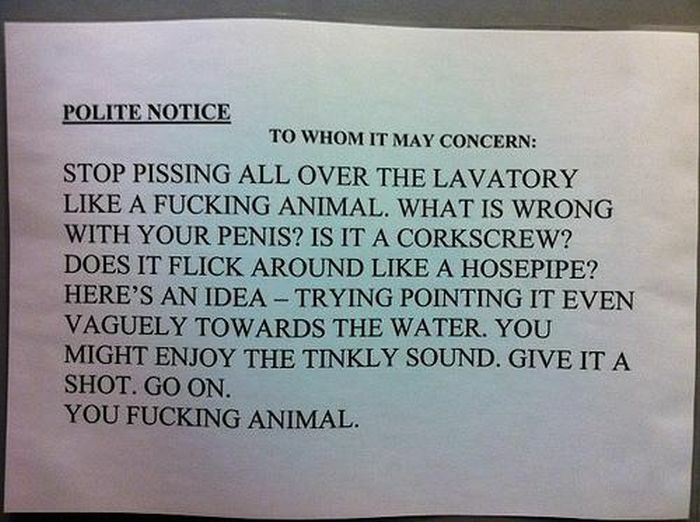 Like if we were reading the script for an Animal Planet or Discovery Channel show, this worker made a clear point. You shall eat in the kitchen or face the buggy consequences! This one was a clever response. A mix between the expiry date of the food in the fridge and the impossibility to date a nice can of food that could marry you one day. 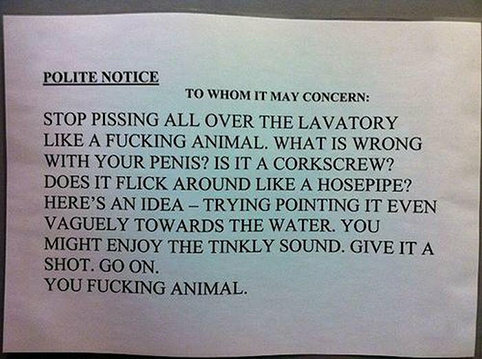 This is a pretty disgusting add on the bathroom door. 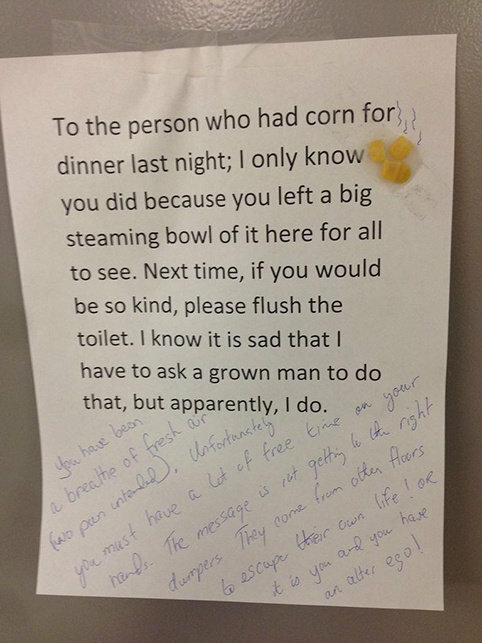 How could anyone be capable of sticking a few corn kernels in the sign? I would shout louder to the responsible of that than to the one who left the steaming bowl. I think this one went too far and crossed all the limits. 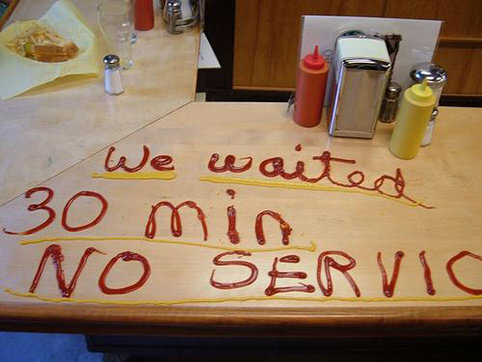 Maybe the waiters and waitresses were too busy with other tables and the place was too crowded. This isn't cool. 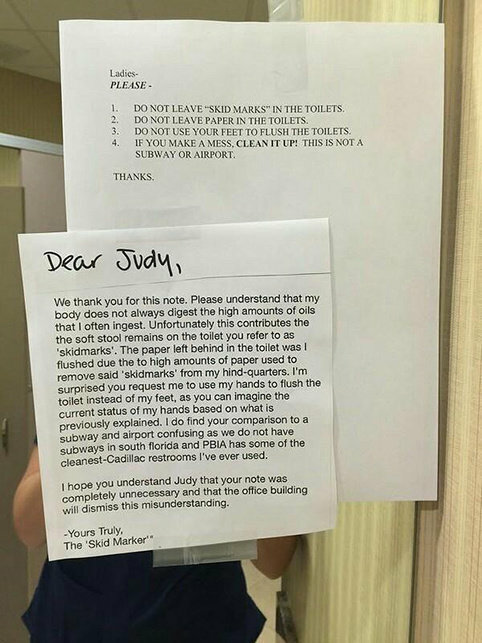 Poor Judy that not only has to clean the mess in the bathroom but also deal with this great response. 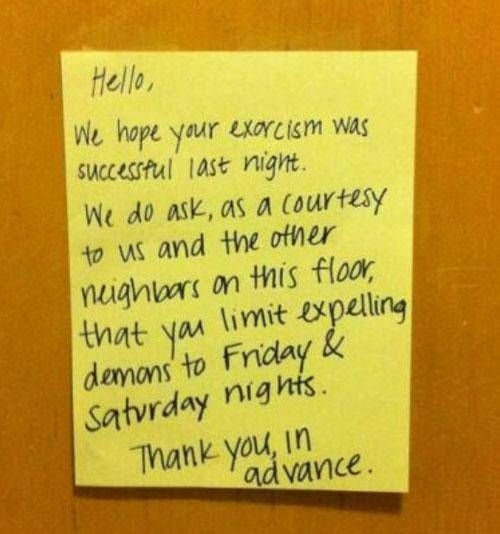 Next time she will think twice before leaving a note. Do you care about your life? 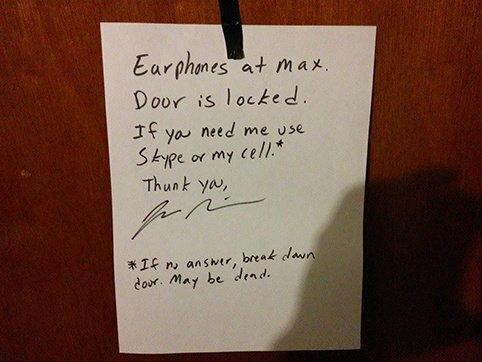 This is a cool way of expressing a threat. I'll think it twice before I left the bathroom in worst condition than the moment before I got in. Everyone should think so. 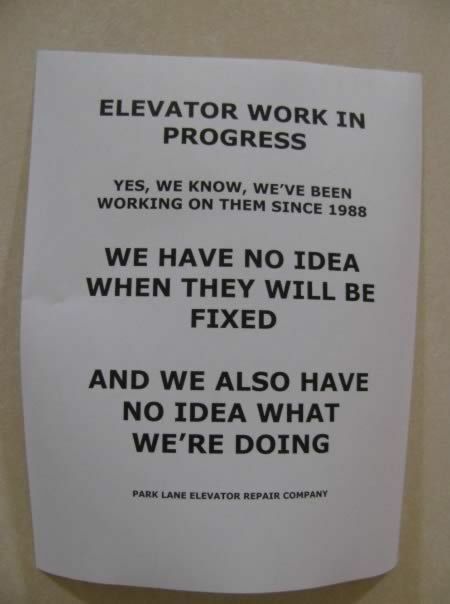 So if the company has no idea of what they are doing in the building, who has it? This is the best way to express to people that you won't be answering questions. 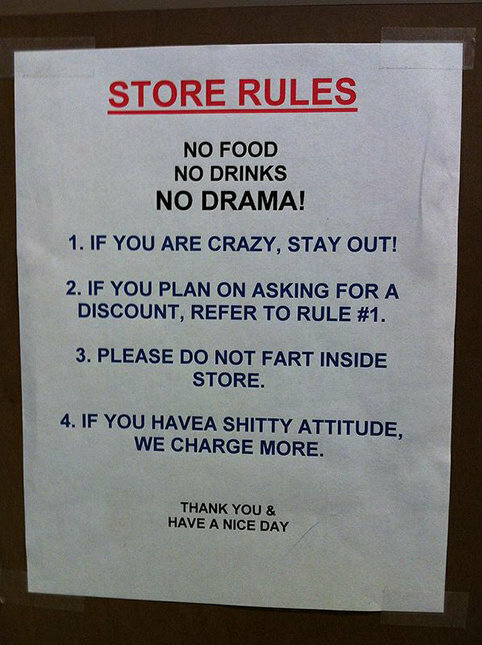 Look at the rules before you enter into that store. They aren't too many and you can learn them really fast in order to have a nice experience buying stuff. This sounds like the note of a person really really angry and tired of cleaning the mess of everyone else. What's with the vocabulary? 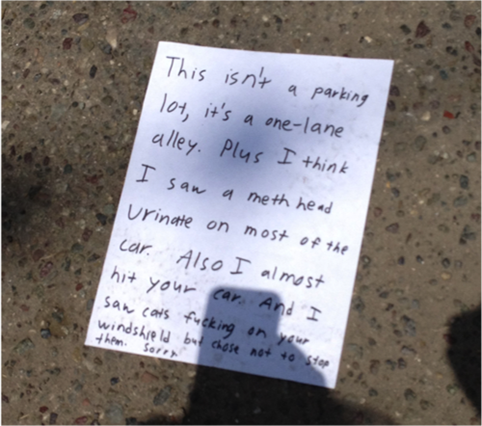 Did he or she leave a politer note before? 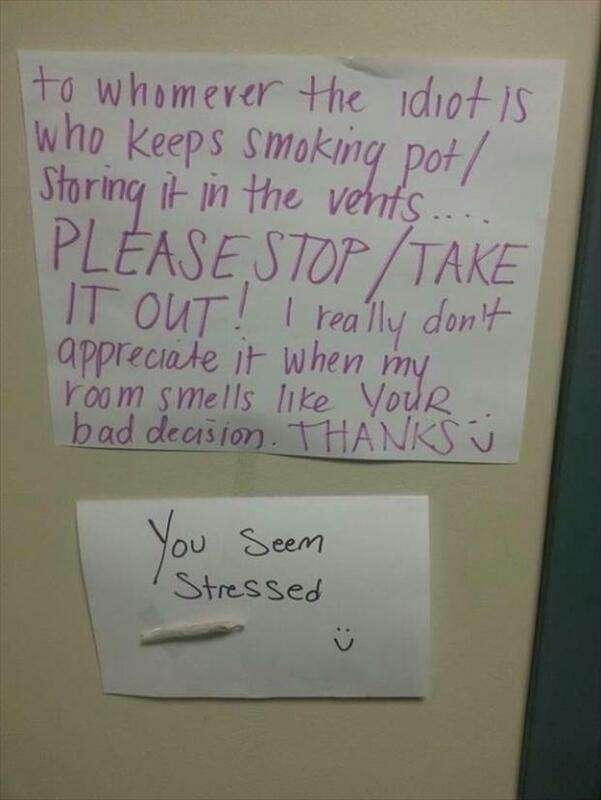 I agree with both notes. 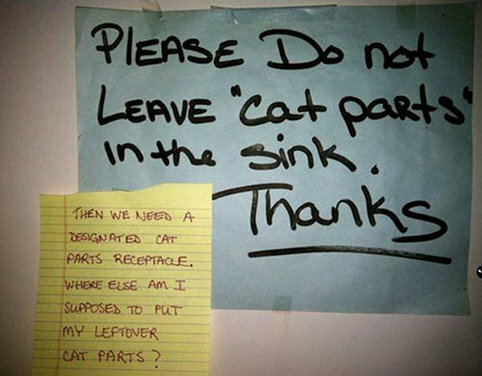 Where are we supposed to put our leftover cat parts? 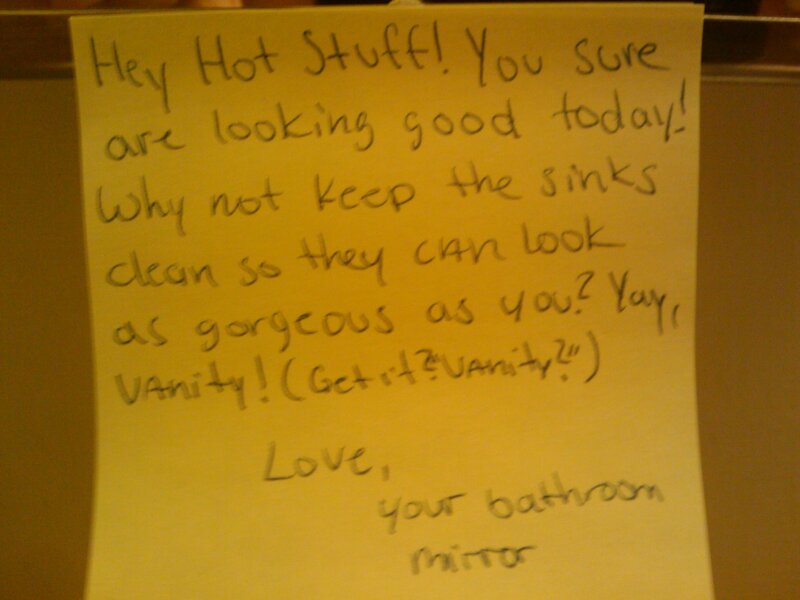 Before writing a note you should put the correct receptacle so we can be all on the same page. So people are a little tired of your smells and noise. Doesn't this ring you a bell? Don't you think you need to reconsider your attitudes in public places in order that all can live well? 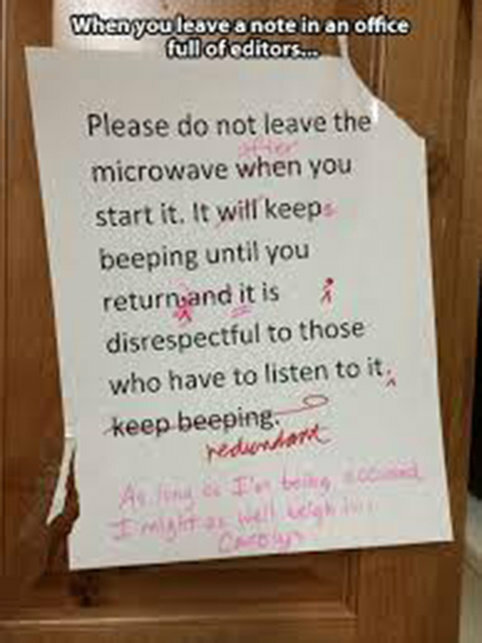 The best way to come back at that person that doesn't respect your personal stuff is putting some personal stuff in them. 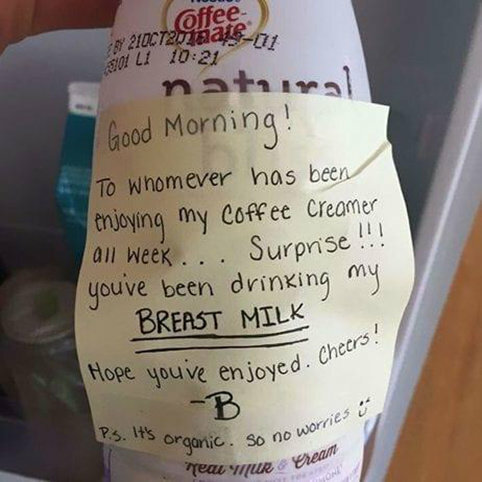 Like the milk of your breasts in the coffee. So the mirror is my fan? 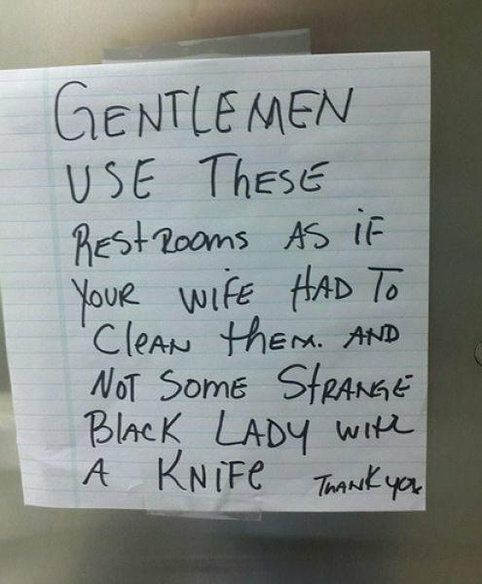 Seriously, how hard can it be to leave the sinks clean? The only thing you have to do is remove all the extra stuff you left after cleaning or whatever you were doing there. This is a problem that happens pretty much in every building of every part of the world. Lucky for the victim, newspapers are tending to disappear and he or she will have to read the news online. 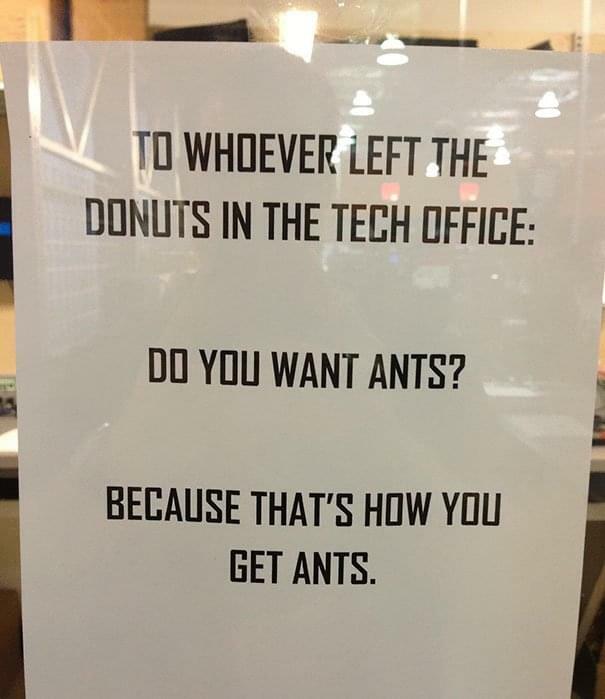 The best thing you can do if you don't want to be disgusted by a bug is let them live. Are they bothering you? Just push them away from your house by the window or the garden door. 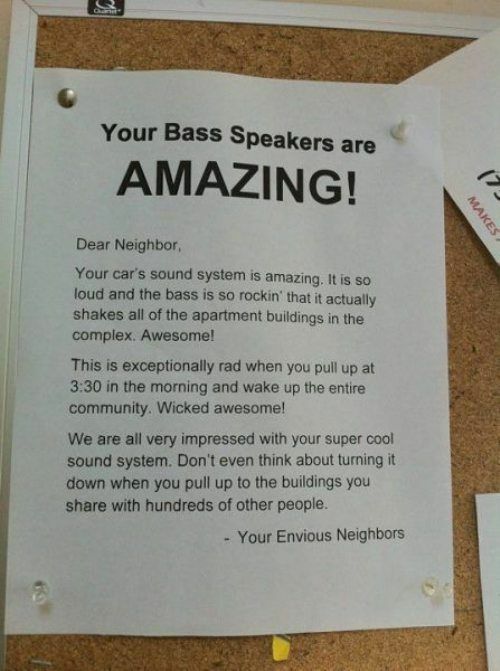 Someone had a great night and let all the neighbors in the building notice that. 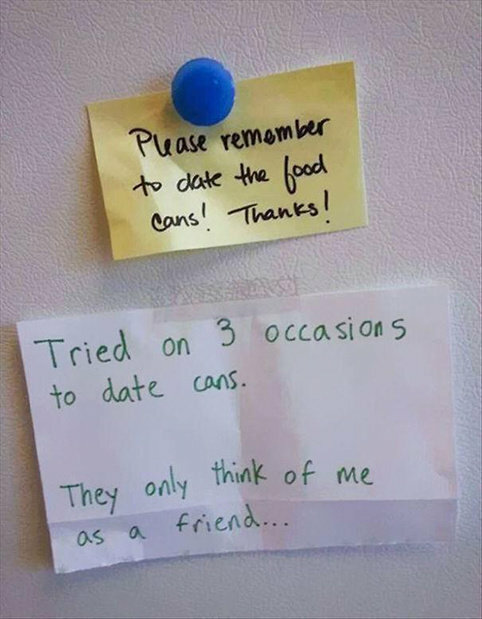 Don't people feel ashamed when these things happen? How difficult is to be a little quieter? 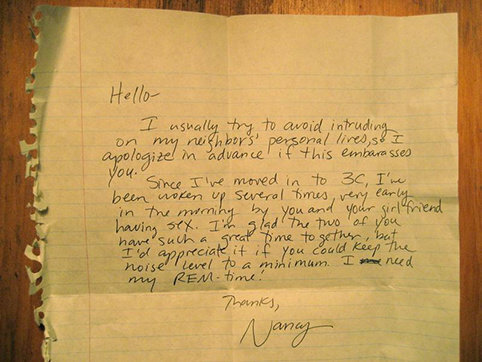 I really liked the way this note expressed how much this person needs to sleep. Is this person really talking about REM and not only resting time? That should be convincing. 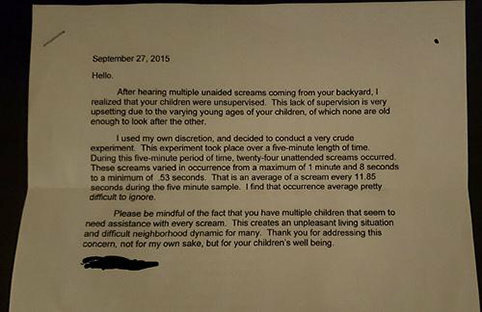 Oh, I really hate children screaming, it really pisses me off. 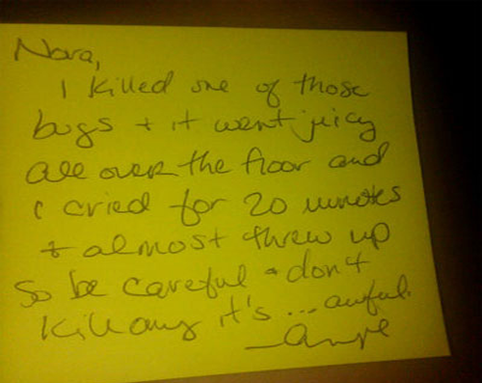 So I totally agree with the person behind this note and that weird experiment. I hope it taught a lesson to these careless parents. 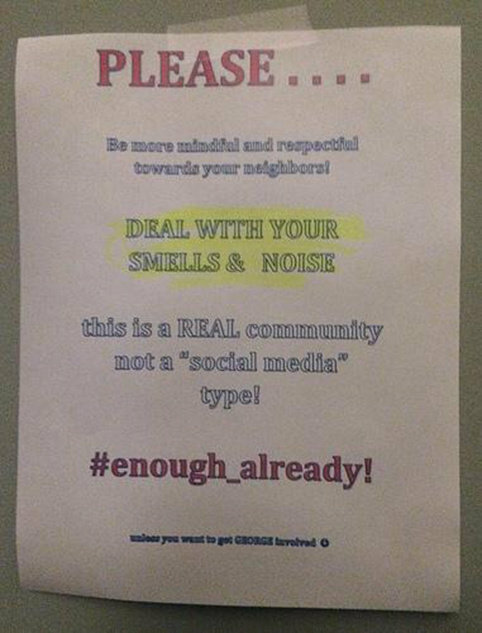 What's with people trying to experiment with notes and Microsoft Word Fonts? Why can't they just write their messages in the preset formats that came with the program? Why does everyone have to listen to your music? This is a practice that pretty much every stupid guy does all over the world. Why do they think that it's cool to show the entire block the amazing music you are listening to? 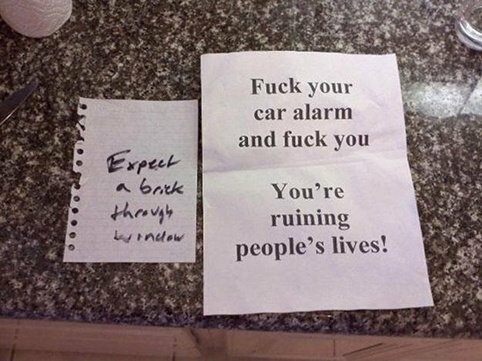 It looks like two neighbors got tired of the stupid alarm system that went off at every movement around the car. Even when it was windy it was impossible to rest. So be notified! This neighbor was a little tired of the car parking all the time in the street and obstructing the way for people and cars passing by. If there's no space, do not park! 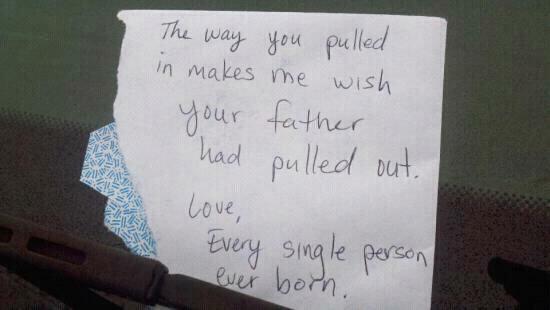 A nice and clever way of expressing that you wish someone wouldn't exist. So the messenger is angry about the driver blocking the exit or just using more than one parking lot? Maybe the thief was having a party and needed the paddling pool to cool the beer for the guests. We hope this thief returns it after having the party and returns it in the best condition. "Or break up already". 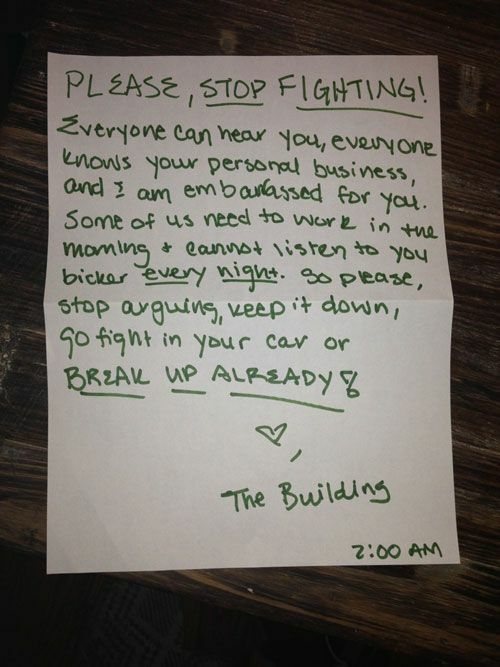 Clever advice for a couple that has made its entire issues a matter of public knowledge. However, it's really hard to keep it down while you're fighting. 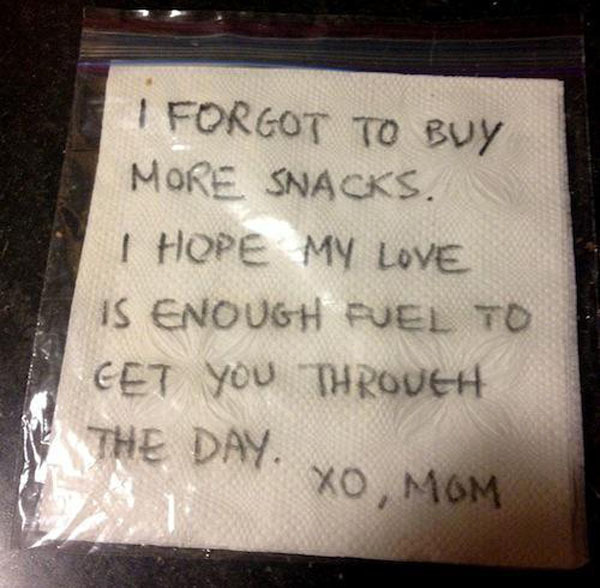 Nice try mom! You know I need my food really bad and it isn't enough for me to read your letters while I'm starving at school. Hope this never happens again. Why do the editors need to edit everything they read in their lives? I thought this was a thing that only happened with a few of them but it seems like a common disease all over the world. Max had the best idea to let the people around the house know what was happening in his bedroom. Hope he didn't get to the point of being dead in the room. 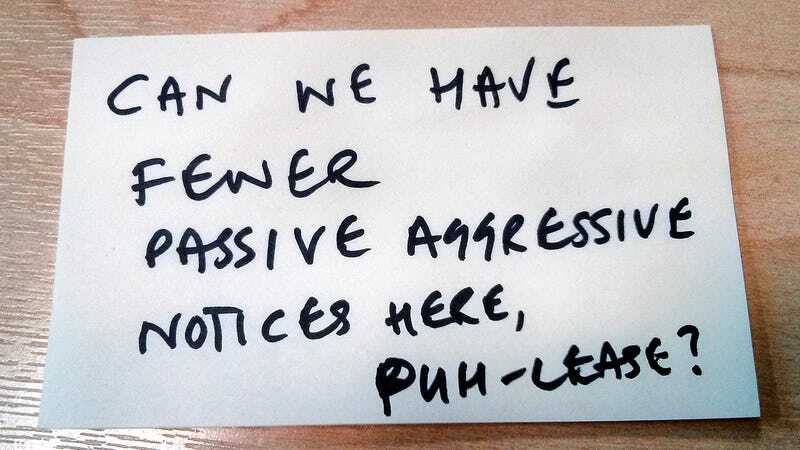 These notes have a message a little too aggressive. 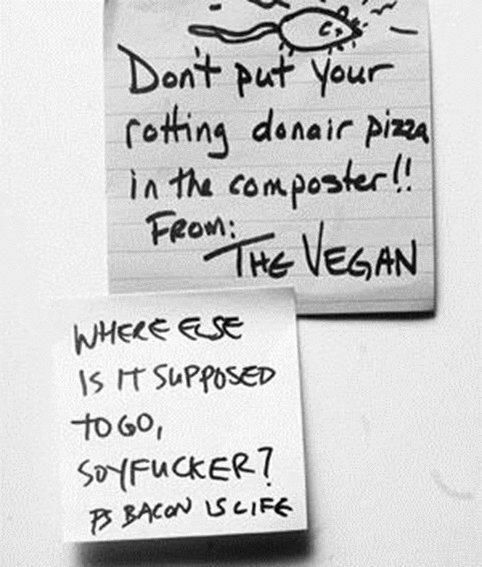 I'm wondering if there was another response to the one that waved the flag of bacon in front of the vegan. 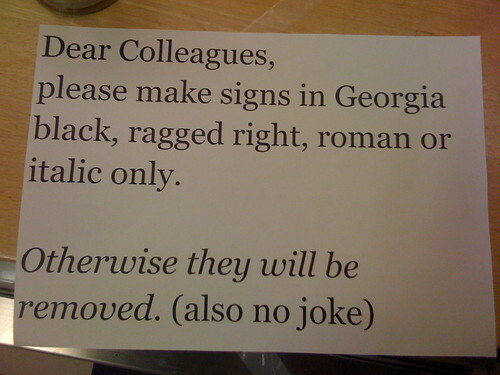 Someone got tired of reading all the notes at work. It's that or maybe this person got tired of being answered with this kind of passive-aggressive notes all the time. Who is the best at spitting at work? 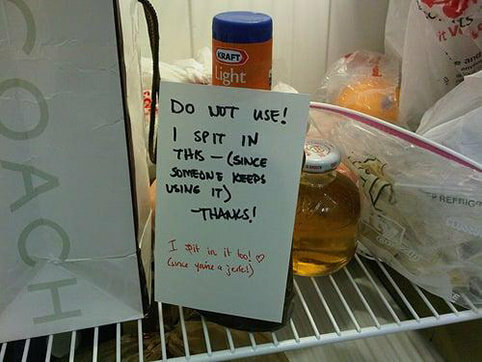 Why do people think the best way to forbid anyone else from using their stuff is to spit on them? I'm not sure if I would like to eat my own spit. The best way of getting some things done by religious people is by talking to their guilt. 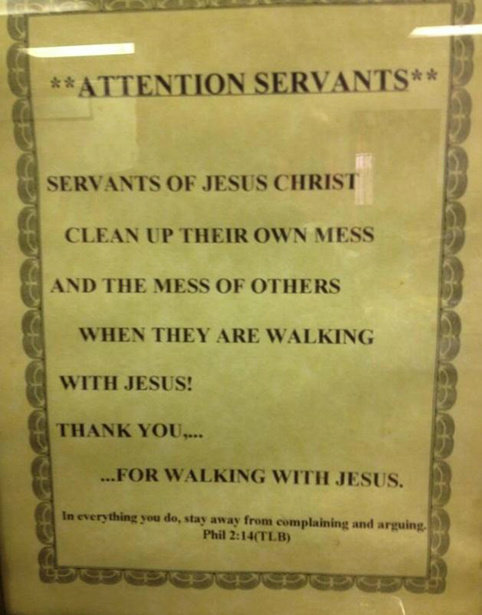 Like these people who love to "walk with Jesus" but don't like to clean the mess. 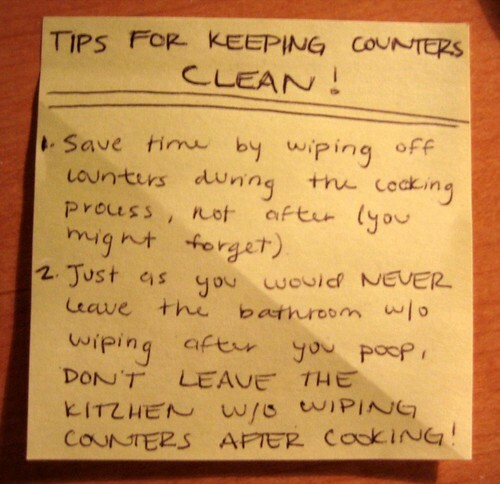 I'm sure you can leave the kitchen clean by spending no more than 10 or 15 minutes wiping the counters and the things you used. Is not fair for the people that come after you to find a dirty kitchen. Here's a note you might read and at the same time you will listen to the voice of the person behind this message. 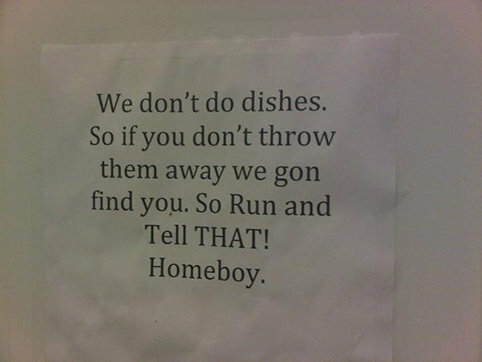 I hope it's clear that they don't do dishes, homeboy! The stealers didn't know that all the cases were empty, so jokes on them that were disappointed when they open the cases at home. 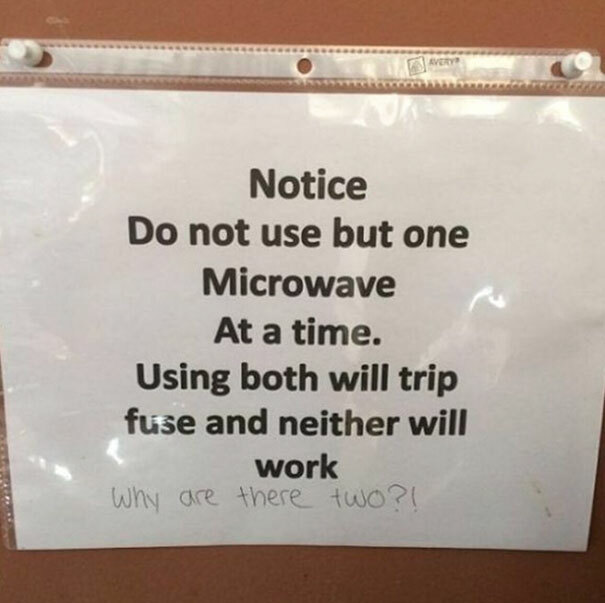 Besides, don't you have internet at your houses? 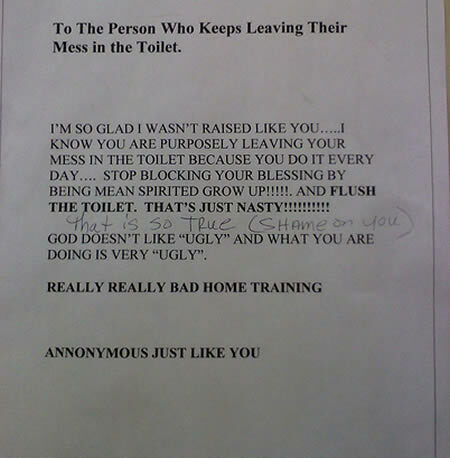 Once again, dirty toilets and people who don't flush tend to create the opportunity for a passive-aggressive note. This one appeals to the person behind this to rethink the education received at home. Today the mixer must be full of sticky notes all over it. Cheers to the one that started a great and funny tradition at work. 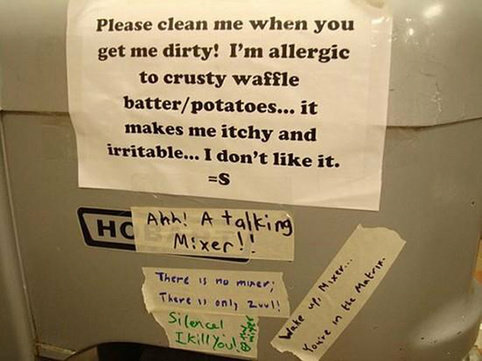 But seriously, keep the mixer clean! 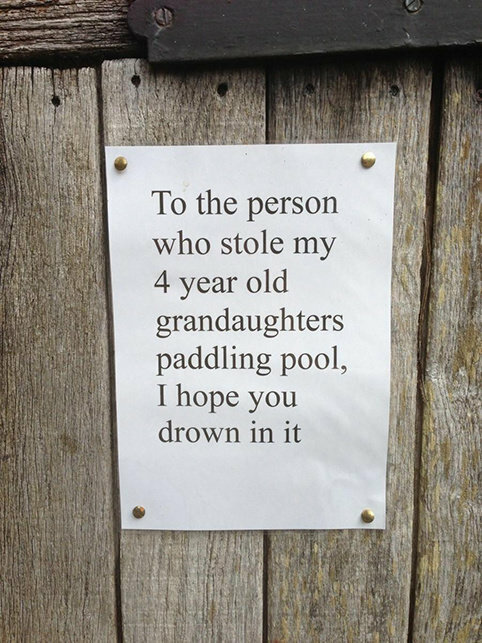 Joke's on the water thief. 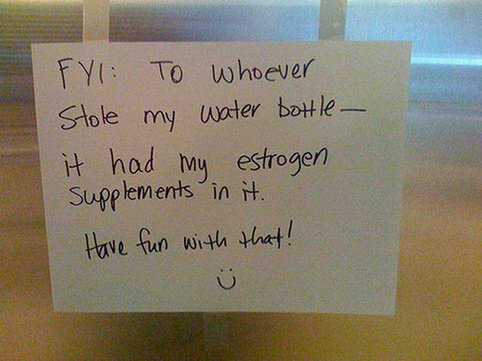 Will this person have to see a doctor in order to equilibrate his or her hormones? I think this could be the last time the thief tried to steal something.